Ready for round three! After a slight delay, Intel releases the next generation of the extremely successful Sandy Bridge architecture on the market. A revolutionary 22-nanometer manufacturing and a greatly improved graphics unit are to make up for the delay of the third generation Core architecture. The current 32nm Sandy Bridge architecture still holds the mobile (and desktop) performance crown, but Intel doesn't take breaks. 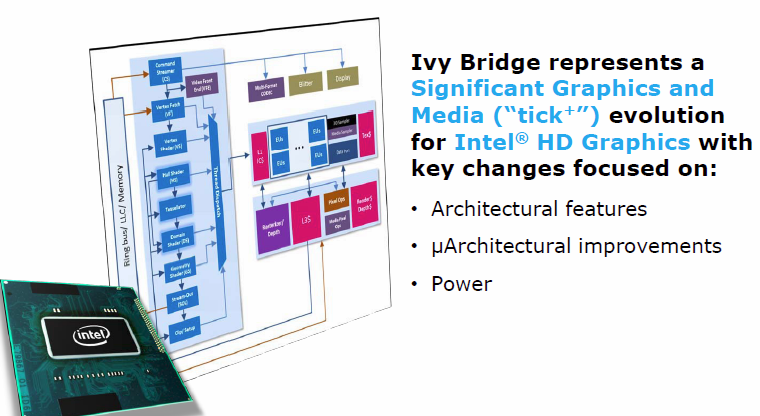 Instead, it revs up: the new Ivy Bridge architecture is what Intel calls a "tick+" - denoting a change bigger than the usual process shrink of an existing design, but smaller than an entirely new architecture (which will come this time next year with Haswell). We want to take an in-depth look at Ivy's innovations and also shed light on the revolutionary 22-nanometer process technology. The second half of this review will deal with extensive processor benchmark tests, while we examined the graphics performance of the HD 4000 GPU in another review. Unfortunately, we can't reveal any information about the dual-core models that are to follow at a later date. However, we will put them through our test course as soon as possible. 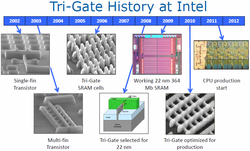 For years, Intel has been at the forefront of the industry when it comes to manufacturing process technology. The new 22-nanometer generation is an especially important one, and features a few interesting improvements. Around 2002, the manufacturer began to lay the first foundations for the process internally known as P1270. The major improvements are found particularly on the transistor level. For the first time, Intel is using Tri-Gate transistors - a three dimensional structure of source and drain that juts out of the actual substrate and into the gate. Compared to a common (2D) planar transistor, the conductive channel is enlarged in an active state and the current flow increases. This effect can be enhanced even more by using several "fins". 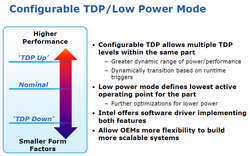 Intel promises the biggest gain at low voltages, which is particularly beneficial for mobile processors. Depending on the application, it is possible to select whether the performance is to be enhanced or the power consumption is to be reduced - or even a combination of both where necessary. 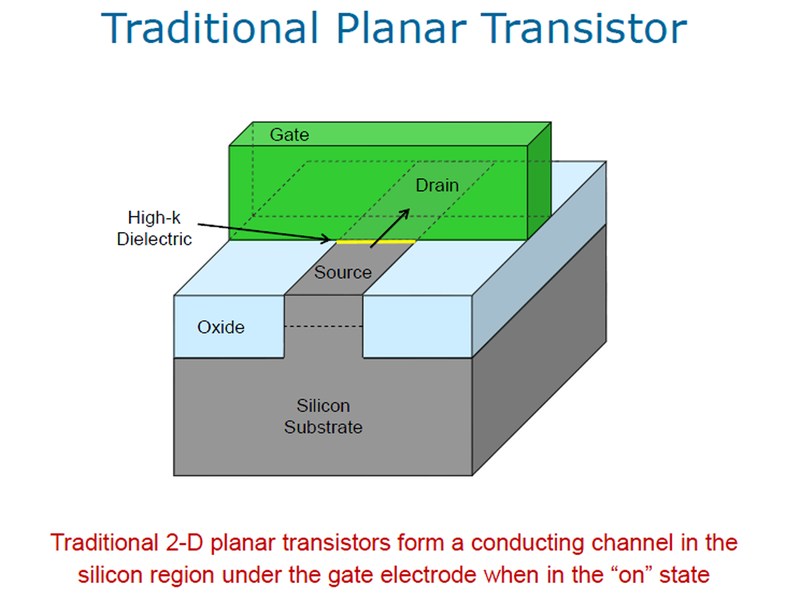 In addition to these advantages, the new transistors stand out with particularly low leakage currents, comparable to depleted silicon-on-insulator (FDSOI). In contrast to this technology, which leads to an approximately 10 percent higher production cost, Intel's approach also remains relatively cheap with a price increase of roughly 2 to 3 percent. Another important incentive for the steadily shrinking structures is the resulting increase of component density. While a quad-core based on Sandy Bridge harbors approximately 1.16 billion transistors on an area of 212 mm2, a comparable Ivy Bridge die shrinks to only 160 mm2 despite a total of 1.4 billion transistors - that is an increase of roughly 60 percent per square millimeter. Density may even double in certain areas. Intel has currently converted three of its factories (D1D Oregon, Fab 32 Arizona, Fab 28 Israel) to the new process and others are to follow. 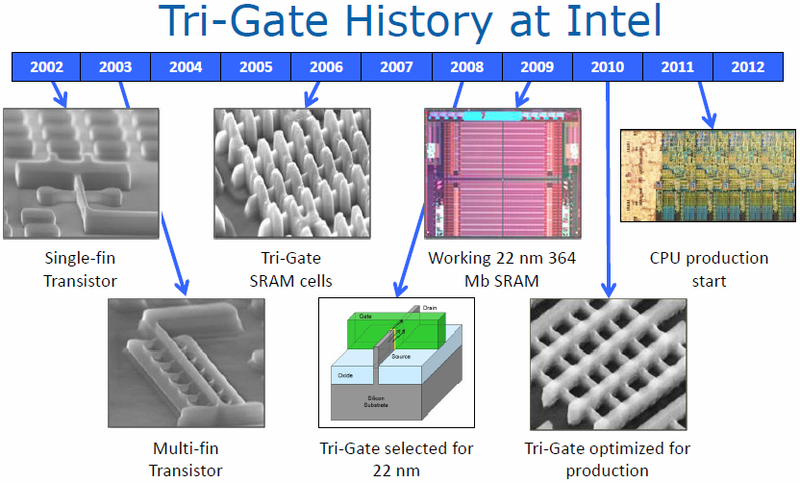 Apart from Ivy Bridge, more 22-nanometer products are expected in the coming months and years, such as Valley View - the next iteration of Atom. Intel is planning to produce the first 14-nanometer chips as early as at the end of 2013 - but that's all still up in the air. With every smaller process the technical challenges, and consequently the costs for research and development, increase immensely. Beyond that, a quad-core with a slimmed down GT1 graphics unit ("4+1") is to be available for the desktop sector; the dual cores are to follow later. Here, two different versions in form of a GT1 ("2+1") and a GT2 GPU ("2+2") with probable die sizes of 90 and 120 mm2 are also expected. 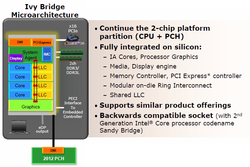 The Ivy Bridge processor core is fundamentally based on its Sandy Bridge predecessor, and thus includes known features such as Hyper Threading and Turbo Boost 2.0. Thus, we would refer to our Sandy Bridge review for precise details about those features. 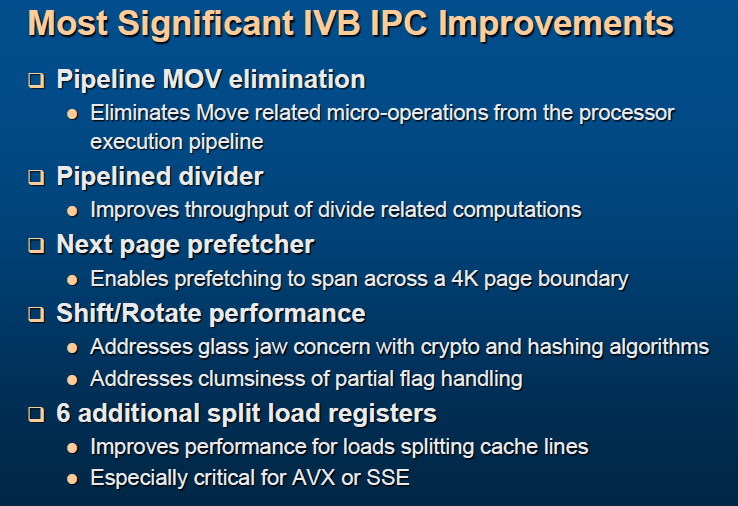 Various minor optimizations can be seen here in detail, and these result in about 5% better IPC. 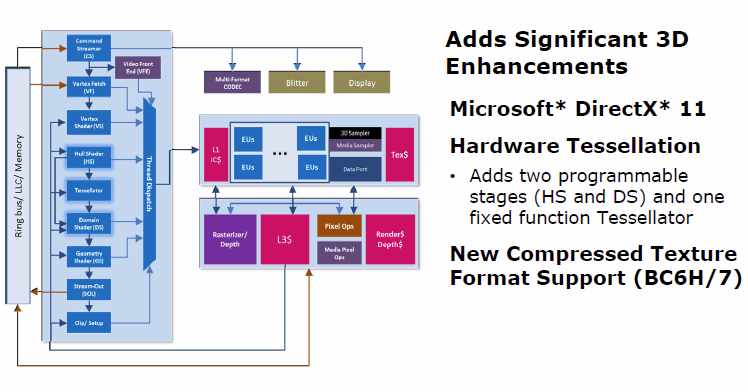 Thus MOV instructions, where the contents of a register are copied into another, are now solved more efficiently: the physical register file (PRF) introduced with Sandy Bridge, allows simply storing a reference to the desired destination register in conjunction with other changes – this takes some load off the execution units. Other modifications were made in relation to the divider unit (increased throughput), shift/rotate operations, and AVX and SSE commands that are to be accelerated via 6 additional split/load registers. Intel has also revised the prefetcher: the data in the cache is now adapted dynamically and favors bandwidth-heavy applications which exploit the narrow cache more effectively, especially in multi-threading tasks. 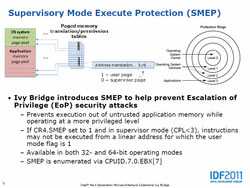 Various new instruction sets conclude the modifications that are introduced with Ivy Bridge. 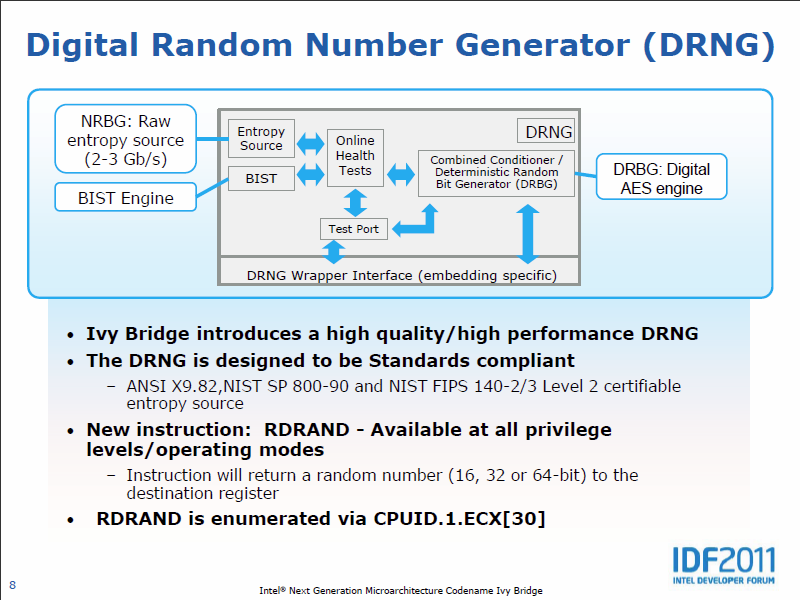 For the first time, there is now a special random number generator (Digital Random Number Generator, DRNG) which is also extremely powerful with a speed of 2 to 3 Gbit/s. The new RDRAND instruction is a real added value in particular for encryption algorithms. In completion of existing technologies, such as NX-bit, the so-called Supervisor Mode Execution Protection will also be introduced. 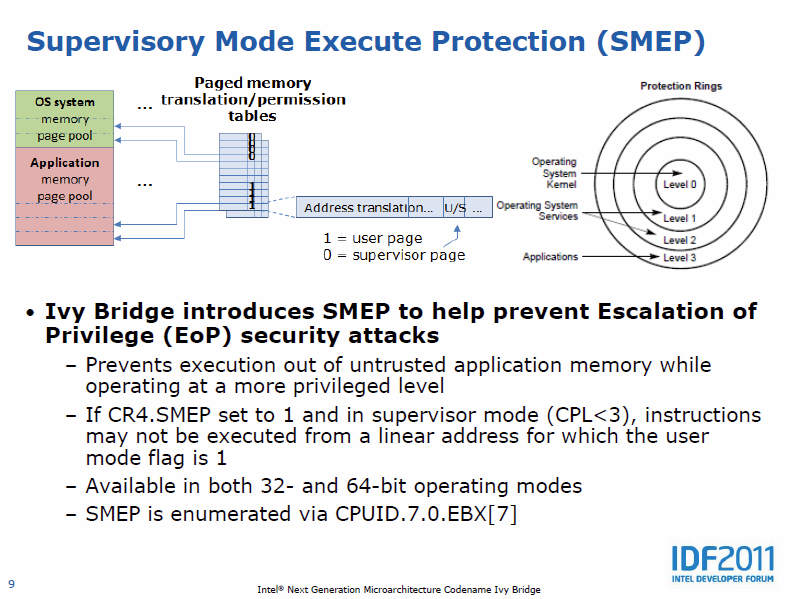 SMEP is to protect important areas of the system kernel against malware by securing them with special flags. The heavily modified GPU is a lot more interesting than the only marginally improved CPU - reason enough for Intel bestow the title "Tick+" to Ivy Bridge. One of the most important innovations is probably seen in the feature set which has been updated to DirectX 11 and Shader Model 5.0 (Sandy Bridge: DirectX 10.1 / SM 4.1) that also includes OpenGL 3.1 and OpenCL 1.1. Accordingly, there are now programmable hull and domain shaders, as well as a fixed-function tesselator, which was sorely missing in previous Intel GPUs. First tests show that the angle dependency is now almost on a level with the competition in terms of the anisotropic filtering quality - another traditional weak spot. 3D performance is consequently much stronger with Ivy. As we briefly mentioned above, there are different versions of the GPU, called GT1 and GT2. GT2 is found in the mobile sector and high-end desktop SKUs. The new HD 4000 GPU (GT2) now features 16 execution units in contrast to the 12 of the HD 3000 (HD 2500/GT1: 6 EUs). Each EU is also significantly faster. The improved units can perform two MAD operations per clock and that together with a second texture sampler (HD 2500: only one) should be responsible for the largest part of the performance increase. To unburden the ring bus interconnect and the limited bandwidth of the main memory, the graphics unit now also has a dedicated L3 cache. Nevertheless, the CPU's cache of up to 8 MB is also available. We examined the performance of Intel's new HD 4000 closer in a separate article, which can be found under this link. Besides the processor cores, the GPU, and the L3 cache, the system agent also takes up a considerable part of the chip's surface. The memory controller now supports up to DDR3-1600 (800 MHz I/O) - up from 1333mhz on Sandy Bridge. However, it now also officially supports DDR3L-DIMMs at only 1.35 volts vs 1.5 volts for standard DDR3. The lower consumption should be of particular importance for energy-efficient devices such as ultrabooks. 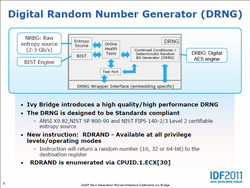 The newly introduced DDR I/O power gating should also enable a longer battery runtime. This feature, completely incorporated in hardware, can reduce the power consumption in idling or low load up to 100 milliwatts. 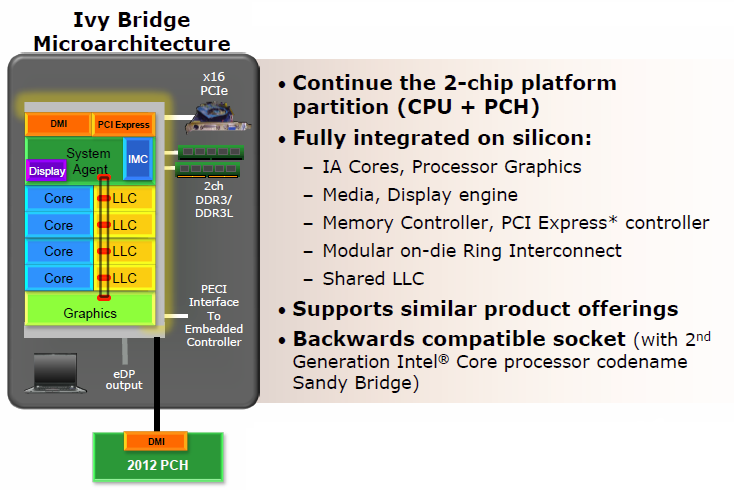 After the uncertainty regarding official PCI Express 3.0 support in the high-end Sandy Bridge E platform, the new standard is part of Ivy Bridge right from the start. Thanks to the increased transfer rate from 5 to 8 GT/s and the more efficient 128b/130b encoding, the bandwidth per link is doubled to almost 1 GB/s. A total of 16 lanes, which can also be divided on several slots depending on the chipset, are available. Contrary to common belief, the display controller and the Quick Sync video encoder are not part of the actual GPU, but are located in the system agent. While Sandy Bridge could only drive 2 monitors with a maximum of 2560 x 1600 pixels, now up to 3 monitors and 4K resolutions (via HDMI 1.4a or Displayport 1.1) are possible. Decoding such high-resolution videos is also supported. The dedicated encoding unit Quick Sync has been revised and now works faster than before. 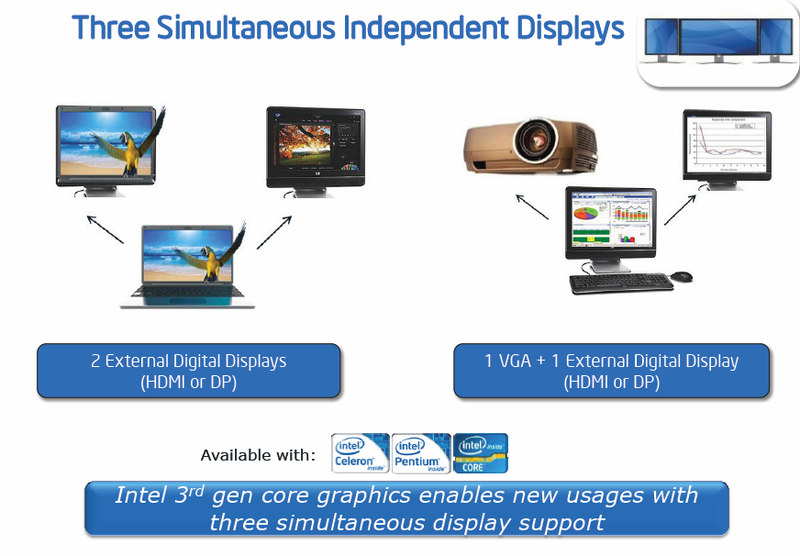 Intel's Wireless Display (WiDi) 3.0 now also transmits in 1080p at 60 fps. Finally, an important note for home cinema fans: Stalling during 24p playback (23.976 Hz) should be resolved. 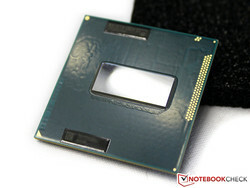 Approximately two weeks prior to launching Ivy Bridge, Intel unveiled its new Series 7 chipset, which includes 5 different models in the notebook sector. 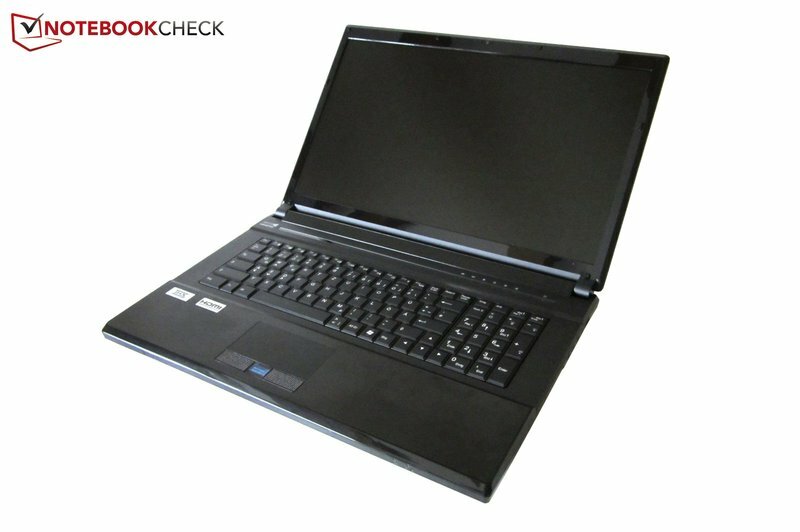 A sixth version, QS76, is an especially energy-efficient version of the QM77 for ultrabooks. With exception of the entry-level model HM75, 4 native USB 3.0 ports are on board for the first time and will likely lead to a significantly increased distribution of the fast transmission standard. No improvements are seen in terms of SATA III; none of the new chipsets offer more than 2 interfaces. All models are presumably based on the same die built in an outdated 65-nanometer process and have a TDP between 3.0 and 4.1 watts. Principally, Sandy Bridge is compatible with the Series 7 chipsets just like Ivy Bridge is backward compatible with the Series 6 chipsets. The latter will only apply to the desktop sector. The lack of firmware and BIOS updates will likely thwart any upgrade plans for notebooks. A smaller manufacturing process also improves a chip's efficiency - however, while the desktop models benefit from Ivy Bridge in the way of a lower TDP, (almost) nothing changes in the consumer notebook categories. 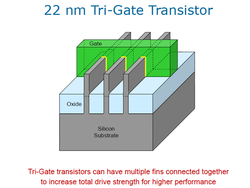 Ivy quad-cores still have a TDP of 45 watts, like Sandy Bridge (and Clarksfield before that). Where only the top model "Extreme Edition" was the exception to the top with 55 watts until now, there is now a 35 watt model available for the first time – the Core i7-3612QM. 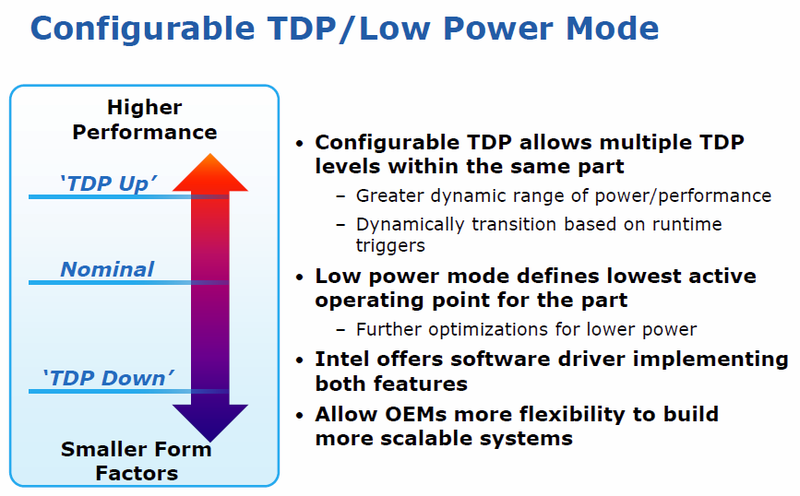 The prospect of adapting the TDP up and downward to a certain extent is fundamentally new. This feature, called "Configurable TDP", increases thermal flexibility. 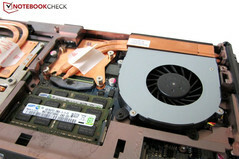 Increasing the TDP at home on the desk would make it possible to maintain the maximum Turbo clock frequency over a longer time when the laptop is connected to the ventilated docking station. Then again, reducing the TDP would increase the battery runtime during mobile use. According to existing information, probably only the i7-3920XM (55 watts nominal, 45 to 65 Watts adjustable) as well as the ULV CPUs (17 watts nominal, 13 to 33 Watts adjustable) will be similarly configurable. All TDP adjustments are made in software. As in previous tests of new Intel processors, Schenker has kindly provided us with a test system this year. The brand new Clevo P170EM barebone, available at Schenker under the name XMG P702 PRO, served as the basis for the following benchmarks. We recommend our in-depth review of the bulky gaming machine, though it should be noted that this review was for an older Sandy Bridge version. It should be possible to completely exploit the CPU's performance potential with 8 GB of RAM and a fast Intel SSD. The installed Nvidia GeForce GTX 670M didn't have an impact on the executed benchmarks either. All measurements were performed with identical test equipment in a static software and driver environment. We have to mention that the processors are still engineering samples which might show a slightly different behavior under certain circumstances than later production models. 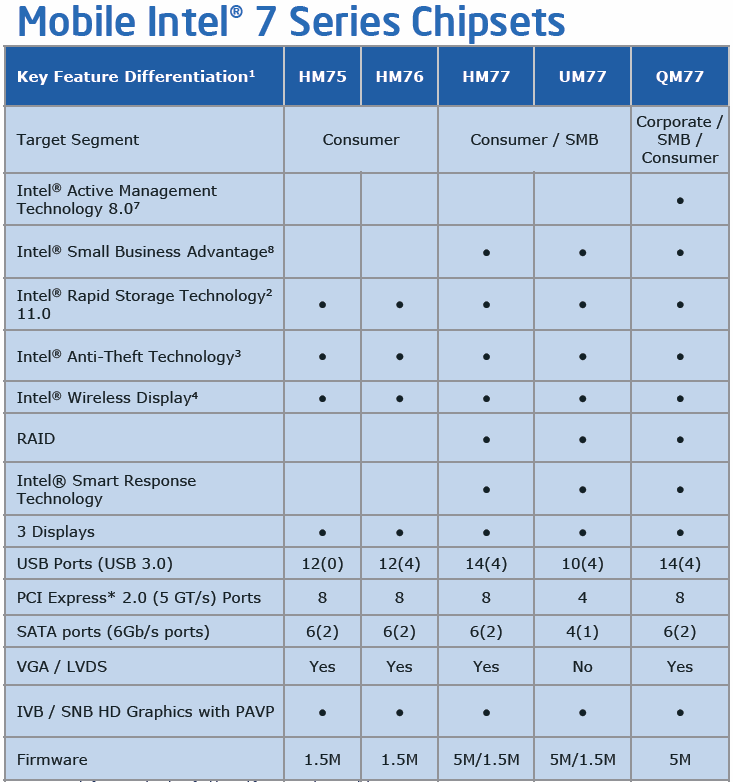 Intel's naming conventions for Ivy make clear that Ivy is a revision of Sandy Bridge. Depending on the model and the Turbo stage, an increased clock of between 100 and 300 MHz are possible; but the cache sizes, TDP stages and prices haven't changed. The only real newcomer is the aforementioned Core i7-3612QM. For the first time, a 35W quad-core, which can also be installed in small 12-14" notebooks, is available. Unfortunately, we didn't have one on hand - but we'll certainly keep trying to get our hands on one. 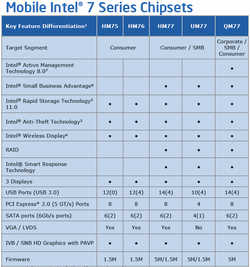 All technical specifications of the new quad-core can be found in the chart below or in the comprehensive detail pages of our CPU database. A short note before we take a closer look at the benchmarks: our CPU results can't inevitably be transferred to other devices because Intel's Turbo Boost technology (automatic overclocking of the processor) behaves differently depending on the cooling system. 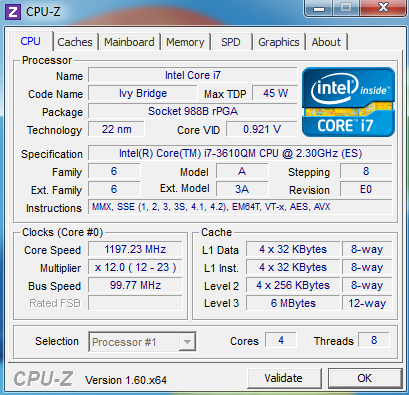 Considering the high performance of the Sandy Bridge generation, it won't be easy for Ivy Bridge to improve the prior top scores significantly. Ivy generally yields a 4 to 10 percent higher score in the single-thread benchmark, which represents a marginal IPC increase of approximately 3 percent with adjusted clock. Larger gains can be recorded in the multi-thread test. The improved 22 nanometer process pays off here as it makes it possible to take better advantage of the maximum Turbo clock speed. Put in relation, the entry-level i7-3610QM quad-core scores best since it can surpass the i7-2670QM by 13 percent. 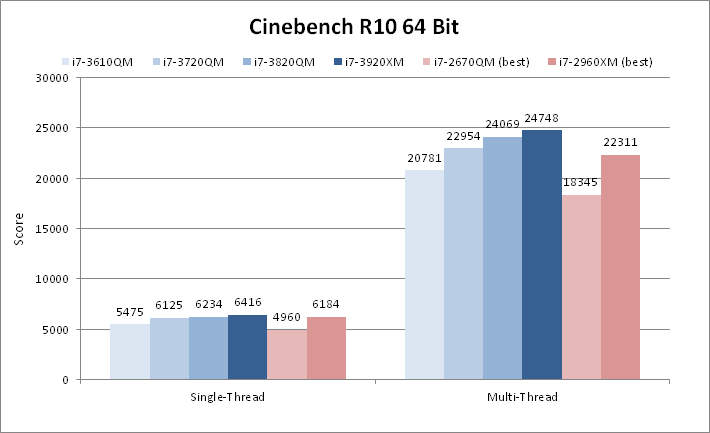 The results of Cinebench R11.5 are very similar to the previous version; an improvement of between 12 and 15 percent. A comparison with the speedy desktop i7-2700K processor provides a remarkable impression of the enormous performance: It only reaches around 7.0 points and thus ends up slightly behind the i7-3920XM. 3DMark 06 and 3D Mark Vantage are in line with our other results. The former leader, i7-2960XM, has to settle between the i7-3720QM and the 3820QM in both benchmarks. The Extreme Edition 3920XM again places itself at the top. Astonishing: With a maximum performance difference of 20%, you should carefully consider if you really need a model faster than the 3610QM. 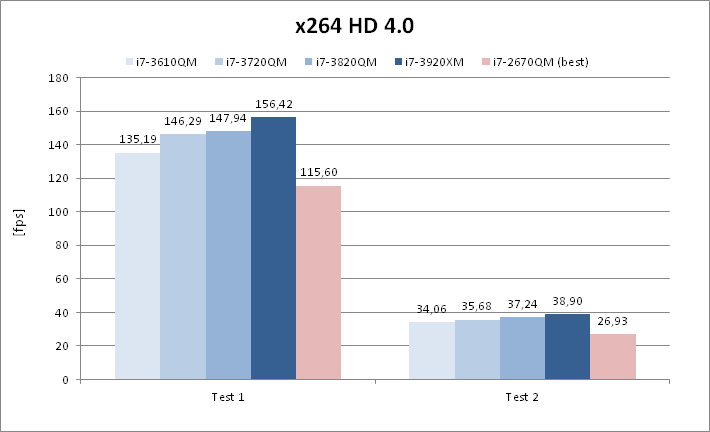 The Ivy Bridge processor seems to especially like the video encoding benchmark x264 HD. The 3610QM already manages to surpass the popular 2670QM predecessor by 17 to 26 percent and the faster versions can break away even more. WinRAR is known to be particularly memory-intensive, so our test system packing DDR3-1333 wasn't ideal. 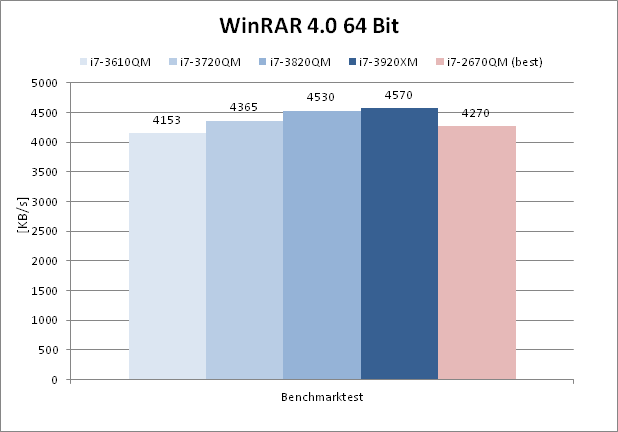 Sandy Bridge is only slightly slower than Ivy here, likely due to WinRAR's dependence on non-CPU elements of the system. 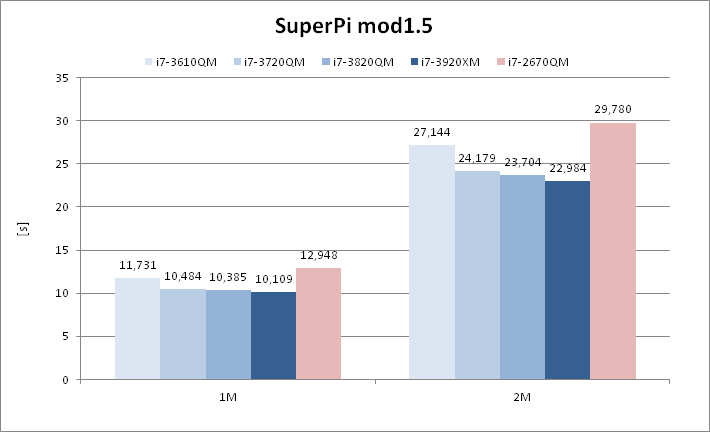 Although it's not very significant for practical use, SuperPi is popular among overclockers and benchmarkers. The program only loads one thread and is very sensitive to fast cache and memory. The i7-3920XM only misses the magical 10-second barrier by a tenth of a second. This limit should easily be surpassed with fast DDR3-1600 modules. 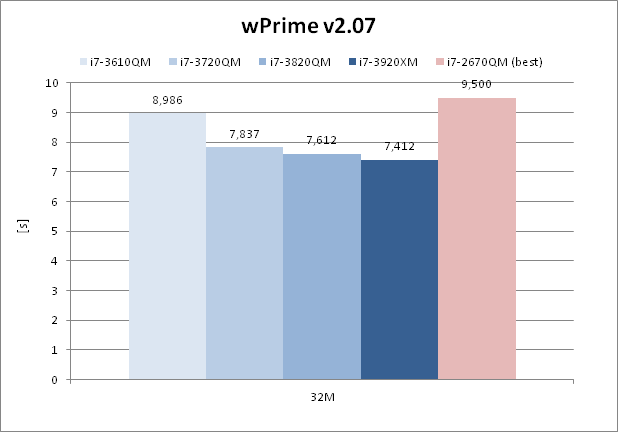 wPrime has similar synthetic characteristics to SuperPi, but it exploits all available threads. 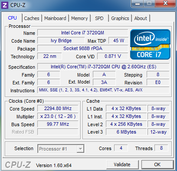 We also only see a slight advantage compared to Sandy Bridge at the same clock speed. Although no changes have been made to the TDP categories on paper, we want to take a close look at the power consumption of Ivy Bridge. For this, we measured the entire notebook at the wall. 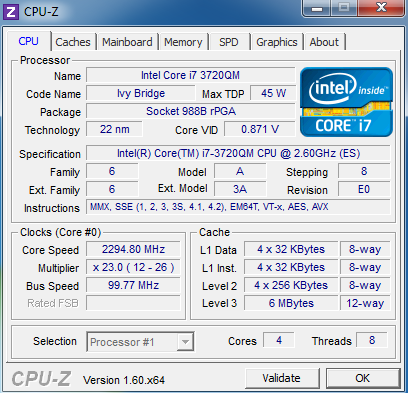 Intel appears to have increased the idle speed from 800 to 1200 MHz, which will presumably impact energy draw. 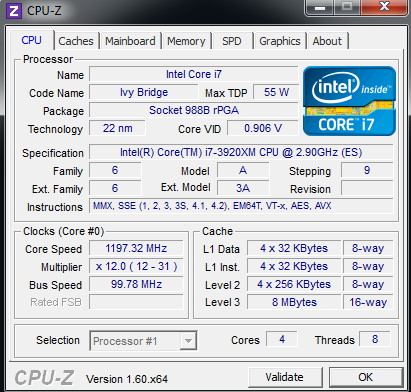 Nevertheless, we ascertained a reproducible increase of approximately 2 watts in all Ivy Bridge models compared with the old i7-2760QM – likely still a BIOS issue or peculiarities of the pre-production CPU. We will examine the upcoming production models closely for confirmation. The contenders are all quite close under light load. However, we have to point out that the Ivy Bridge models exploit their Turbo mode more efficiently. The i7-2760QM achieves only 3.2 GHz of the possible 3.5 GHz after heavy use, just like the 3610QM (maximum 3.3 GHz). The i7-3720QM, 3820QM and 3920XM also only stay behind their theoretical maximum rate by approximately 100 MHz. Almost the same picture can be seen during full load. 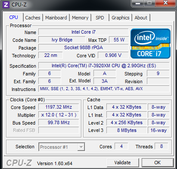 Sandy Bridge operates with a few watts less, but also clocks considerably lower. 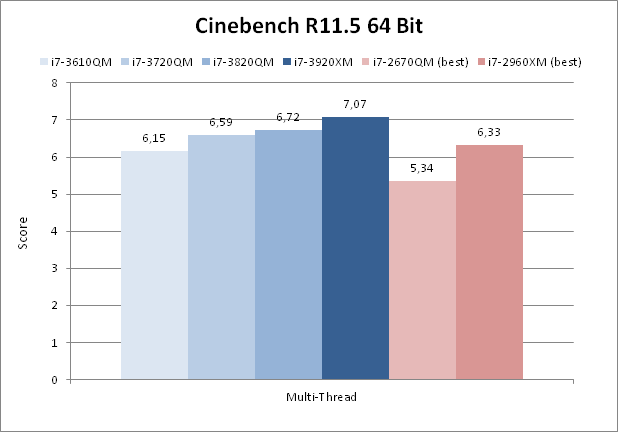 While the i7-2760QM drops to 2.8 and 2.6 GHz in Cinebench and Prime, the i7-3610QM stays constant at 3.1 GHz. The other two 45 watt models manage about 100 to 200 MHz more and the i7-3920XM at 55 watts tops that by 100 MHz. However, especially the top model shows quite intense clock fluctuations so these specifications should only be seen as a rough guide. After Sandy Bridge treated us to a gigantic performance leap last year, our verdict concerning Ivy Bridge is a bit more restrained. While more moderate performance increases during tick (and even tick+) years are to be expected, they are still a little disappointing, living as they do in the shadow of exciting tock years. Despite this small disappointment, two facts can be ascertained: First, there is still no way of getting around Intel when looking for a high-end notebook processor. Ivy Bridge is far faster than AMD's Llano, and will likely be much faster than Trinity as well - at least in terms of CPU performance. Second, we expect that a first clock update will arive in the fall and contribute to Ivy's performance advantage over Sandy. However, if you are the owner of a Sandy Bridge notebook, you will likely see little reason to upgrade to Ivy Bridge. Our favorite chip of the Ivy family is the Core i7-3610QM. The performance loss is measurable, but not really noticeable, and should be considerably cheaper. Particularly price-conscious buyers should take a look at discontinued Sandy Bridge machines or wait for the launch of dual core models expected in early summer.